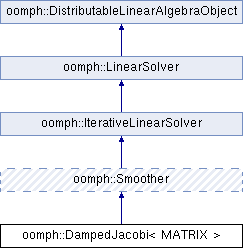 Damped Jacobi "solver" templated by matrix type. The "solver" exists in many different incarnations: It's an IterativeLinearSolver, and a Smoother, all of which use the same basic iteration. Definition at line 1012 of file iterative_linear_solver.h. Definition at line 1018 of file iterative_linear_solver.h. Definition at line 1025 of file iterative_linear_solver.h. Definition at line 1032 of file iterative_linear_solver.h. Definition at line 1044 of file iterative_linear_solver.h. References oomph::DampedJacobi< MATRIX >::Matrix_can_be_deleted, and oomph::DampedJacobi< MATRIX >::Matrix_pt. Referenced by oomph::DampedJacobi< MATRIX >::~DampedJacobi(). Function to extract the diagonal entries from the matrix. Definition at line 1073 of file iterative_linear_solver.h. References i, oomph::DampedJacobi< MATRIX >::Matrix_diagonal, and oomph::DampedJacobi< MATRIX >::Matrix_pt. Referenced by oomph::DampedJacobi< MATRIX >::smoother_setup(), and oomph::DampedJacobi< MATRIX >::solve(). Definition at line 1201 of file iterative_linear_solver.h. Definition at line 1038 of file iterative_linear_solver.h. Definition at line 1179 of file iterative_linear_solver.h. References oomph::DampedJacobi< MATRIX >::Matrix_pt, oomph::DampedJacobi< MATRIX >::Resolving, and oomph::DampedJacobi< MATRIX >::solve(). Setup: Pass pointer to the matrix and store in cast form. Definition at line 1059 of file iterative_linear_solver.h. References oomph::DampedJacobi< MATRIX >::extract_diagonal_entries(), oomph::DampedJacobi< MATRIX >::Matrix_can_be_deleted, and oomph::DampedJacobi< MATRIX >::Matrix_pt. Definition at line 1132 of file iterative_linear_solver.h. References oomph::DampedJacobi< MATRIX >::Matrix_pt, oomph::DampedJacobi< MATRIX >::solve_helper(), and oomph::Smoother::Use_as_smoother. Use damped Jacobi iteration as an IterativeLinearSolver: This obtains the Jacobian matrix J and the residual vector r (needed for the Newton method) from the problem's get_jacobian function and returns the result of Jx=r. Definition at line 1886 of file iterative_linear_solver.cc. Referenced by oomph::DampedJacobi< MATRIX >::resolve(). Definition at line 1149 of file iterative_linear_solver.h. References oomph::DistributableLinearAlgebraObject::build_distribution(), oomph::DistributableLinearAlgebraObject::distribution_pt(), oomph::LinearSolver::Enable_resolve, oomph::DampedJacobi< MATRIX >::extract_diagonal_entries(), oomph::DampedJacobi< MATRIX >::Matrix_can_be_deleted, oomph::DampedJacobi< MATRIX >::Matrix_pt, oomph::DampedJacobi< MATRIX >::Resolving, oomph::DampedJacobi< MATRIX >::solve_helper(), and oomph::Smoother::Use_as_smoother. This is where the actual work is done – different implementations for different matrix types. Definition at line 1951 of file iterative_linear_solver.cc. References oomph::DoubleVector::build(), i, oomph::BlackBoxFDNewtonSolver::Max_iter, oomph::DoubleMatrixBase::multiply(), oomph::DoubleVector::norm(), oomph::DistributableLinearAlgebraObject::nrow(), oomph::oomph_info, oomph::DoubleMatrixBase::residual(), oomph::Global_string_for_annotation::string(), and oomph::TimingHelpers::timer(). Referenced by oomph::DampedJacobi< MATRIX >::smoother_solve(), and oomph::DampedJacobi< MATRIX >::solve(). Definition at line 1230 of file iterative_linear_solver.h. Referenced by oomph::DampedJacobi< MATRIX >::iterations(). Definition at line 1227 of file iterative_linear_solver.h. Referenced by oomph::DampedJacobi< MATRIX >::clean_up_memory(), oomph::DampedJacobi< MATRIX >::smoother_setup(), and oomph::DampedJacobi< MATRIX >::solve(). Vector containing the diagonal entries of A. Definition at line 1219 of file iterative_linear_solver.h. Referenced by oomph::DampedJacobi< MATRIX >::extract_diagonal_entries(). Definition at line 1216 of file iterative_linear_solver.h. Referenced by oomph::DampedJacobi< MATRIX >::clean_up_memory(), oomph::DampedJacobi< MATRIX >::extract_diagonal_entries(), oomph::DampedJacobi< MATRIX >::resolve(), oomph::DampedJacobi< MATRIX >::smoother_setup(), oomph::DampedJacobi< MATRIX >::smoother_solve(), and oomph::DampedJacobi< MATRIX >::solve(). Definition at line 1233 of file iterative_linear_solver.h. Referenced by oomph::DampedJacobi< MATRIX >::DampedJacobi(). Definition at line 1223 of file iterative_linear_solver.h. Referenced by oomph::DampedJacobi< MATRIX >::resolve(), and oomph::DampedJacobi< MATRIX >::solve().